We all know that pasta is a traditional Italian dish. There is nothing Japanese about pasta. When it uses “dashi” (a Japanese broth made from kelp, bonito flakes and dried sardines), fish roe and is eaten using chopsticks, it’s officially a Japanese pasta. There are many varieties of Japanese pasta in the market. Mentaiko (fish roe) spaghetti, uni (sea urchin with cream sauce) spaghetti and kinoko (mushroom) spaghetti are the most popular Japanese spaghetti in Japan. In most of restaurants, mentaiko and uni spaghetti do not contain pork in any form unlike many mushroom spaghetti. It’s said the taste of the fish roe and sea urchin do not blend well with pork. Not to offend the Italians but Japan’s take on spaghetti is always unique and bold to meet the local demand. Japanese love fish as much as they love pork but having pork all the times can be boring. So, through trials and errors several Japanese pasta now becomes extremely popular. 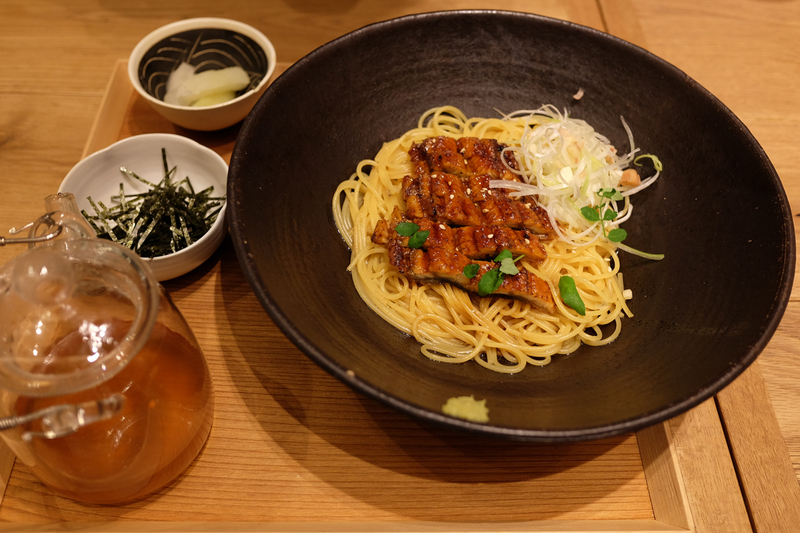 There’s a new Japanese pasta in Tokyo: Unagi (eel) spaghetti. I thought it was weird to mix unagi with spaghetti, let alone having dashi to complement the taste. It took me awhile to finally order unagi spaghetti. Ikumo and I went into serious discussion how unagi spaghetti’s taste would be. I put my bet that the eel would taste great, like it always would. As to the pasta I didn’t dare to guess. My optimism grew as soon as the unagi spaghetti was served on the table. It was an exquisite Japanese dish! 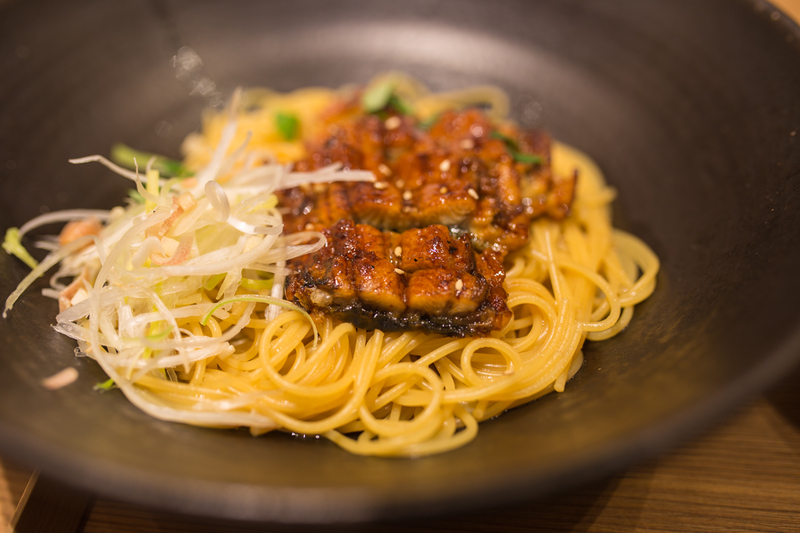 This eel spaghetti is a perfect picture of Japanese pasta. It uses dashi and common Japanese condiments like dry seaweed (nori), leek and wasabi. Never I would think wasabi would elevate the taste of any pasta, let alone complementing the eel. It was a bold attempt to bring Italian pasta close to Japanese’s plate. This unagi spaghetti was flavourful without being overwhelming. It might have been better with a pinch of sansho (Japanese herb made from ground berries of prickly ash tree) instead of wasabi. We frequently dine in Konana restaurant but only at this Christmas holiday we could order unagi pasta. This pasta is a special dish that is not include in the main menu. It might be a seasonal menu that soon would disappear. I hope this unagi pasta will be included in Konana’s main menu because it’s a dish really worth showing off and bragging about. When every restaurant in town goes for regular Japanese pasta, this unagi pasta is hands down. What other Japanese dish in the menu? 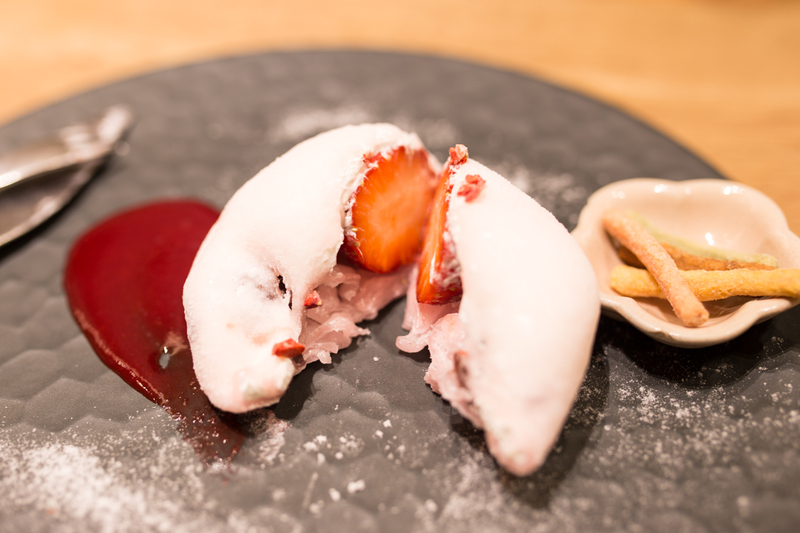 Ichigo daifu mochi, a glutinous rice ball with fresh strawberry and cream in the middle. 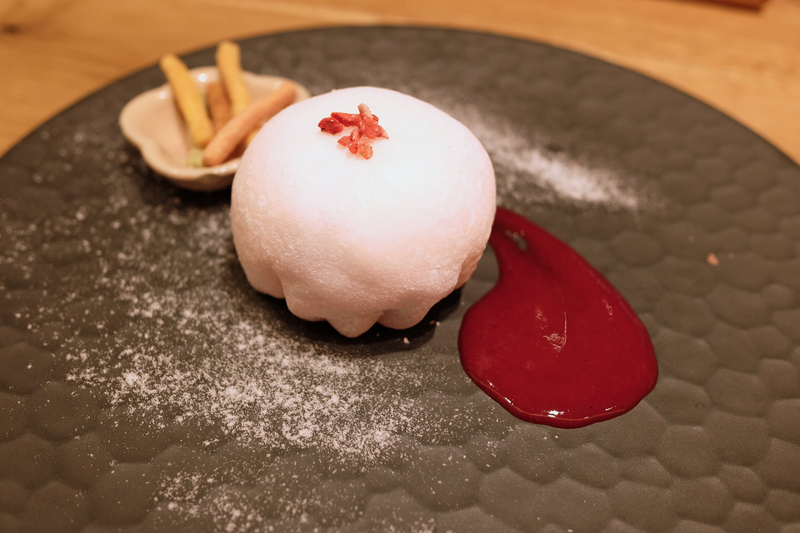 Unlike many other mochi, this ichigo daifu mochi was far from sweet before we got to the fresh strawberry. The strawberry sauce was a perfect marriage between sweet and sour taste. 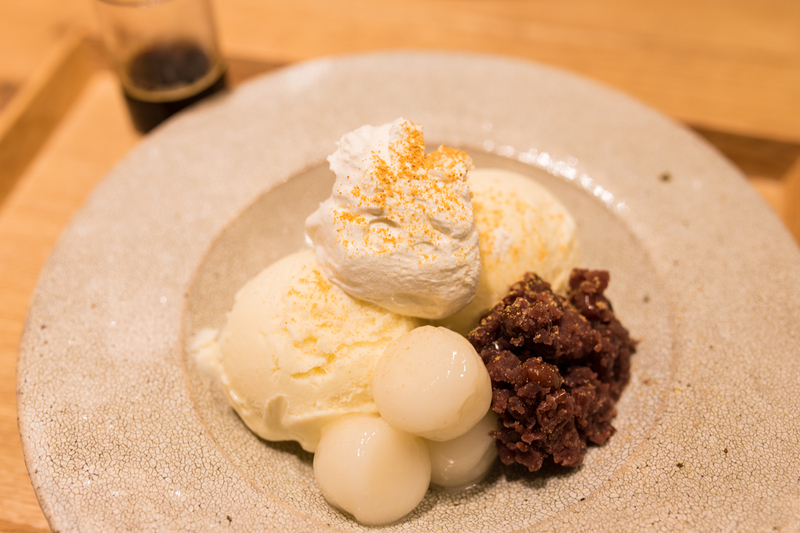 This might be just ordinary ice cream before mochi and azuki (red bean paste) entered the bowl. It’s eaten with a shot of hot espresso that would melt the ice cream and turned it into a traditional espresso cream. The taste…another reason to dine in the restaurant. 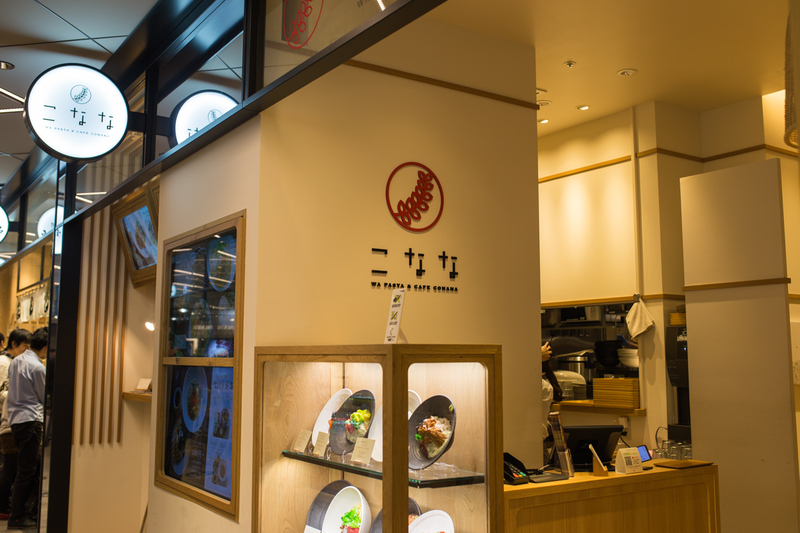 Practical Information: Konana Restaurant, Tokyu Plaza Ginza B2 Floor. Unagi pasta price: 1,680 yen/portion. Order a set menu for a cheaper dessert price.